In this chapter, we discuss the design decisions made when creating the game mechanics and rules for BioSim, a pair of game-like participatory simulations centered around honeybees and army ants to help young children (ages kindergarten through third grade) explore complex systems concepts. We outline four important design principles that helped us align the games and simulations to the systems thinking concepts that we wanted the students to learn: (1) Choose a specific and productive focal topic; (2) Build on game mechanics typically found in children's play; (3) Purposefully constrain children's play to help them notice certain system elements; and (4) Align guiding theories to game rules, and vice versa. We then highlight how these guiding principles can be leveraged to allow young children to engage with complex systems concepts in robust ways, and consider our next steps and goals for research as we continue to iterate and build on these games. Recognizing the many interrelated systems at play in the world around us is difficult. Many adults have trouble understanding systems, such as how many different living creatures interact to survive, or how highway traffic is produced, as decentralized and multilayered (Hmelo-Silver & Azevedo, 2006; Resnick, 1999). Systems thinking allows us to better understand how these many systems that we can see in the world operate. However, the majority of learners do not fully understand the ubiquitous systems around us on a deep level. This has led to several efforts to strengthen education around systems thinking, or systems literacy (Booth Sweeney, 2012) and make these concepts clearer at earlier ages (Assaraf & Orion, 2009; Danish, 2014). One promising approach to helping young students learn about systems concepts is to have them engage in games which allow them to take on a new perspective within a system, and thus help them to appreciate the system dynamics at play (Peppler, Danish, & Phelps, 2010). In our work on the BioSim activities, we engaged in iterative design-based research (Brown, 1992) to explore how to support these ideas through gaming. First, BeeSim (Peppler, Danish, Zaitlen, Glosson, Jacobs, & Phelps, 2010), was created as a “game-like” participatory simulation -- an embodied experience where participants interact to form the simulation, and are supported by computational technologies (Colella, 2000) -- for young children that provides a first-person look into the life of a honeybee and the complexity of nectar foraging behaviors. In BeeSim, students in grades K-3 wear electronically enhanced bee puppets to “become a honeybee” and work together to collect nectar from a field of electronic “flowers.” They also communicate with one another through waggle dances, a real-life phenomenon through which honeybees share locations of known nectar sources. BeeSim stemmed from, and is paired with BeeSign (Danish, 2009; 2014), a computer software simulation that provides the third-person perspective (“bird’s-eye view”) of this honeybee system. Recently, we have expanded this work by designing AntSim; looking at complex systems through army ants gives rise to analogous systems concepts, making transfer an interesting possibility, and both insects offer familiar and fascinating lenses into how systems work. This chapter explores the design decisions made when creating the BioSim set of games to help children engage with complex systems. 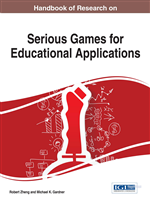 We work to address the following questions: How do we design games to be simultaneously educative and engaging? What tensions arise in the design process when trying to parallel what is known about complex biological systems while essentializing them into a simplified model of game play? We use our latest game-based iterations and refinement of BioSim as illustrative examples of the inherent tensions in the design process of creating serious games in science. This chapter is part of a larger NSF-funded research project that is currently in progress. Current and future research aims to conduct full-scale interventions in early elementary classrooms to iteratively refine both our designs and the undergirding theory guiding this work. To date, early pilot implementations with small groups in after-school clubs have spurred crucial technology iterations, and allowed us to fully test out the activities with our target age group. One of these implementations is described below to help readers visualize the excitement and engagement that occurs during the curriculum. Embodiment: Physically representing actions of another actor or occurrence. Participatory Simulation: People involved act out a simulated process rather than watching the simulation in a computer model. Play: Acting in particular ways possibly aligned with rules that govern an imaginary space. Pheromone: Secreted chemicals that are perceived by other actors as messages to act in certain ways; army ants leave trails of these chemicals to trace travel paths. Complex System: System made up of many interconnected elements on various levels; interactions on lower levels give rise to events on higher levels. Waggle Dance: Scout honeybees do this to communicate location of nectar sources to other foragers. Double-Bind: When students’ current modes of thinking, needs, and the possibilities in the environment are not aligned; students must think in new ways to realign these elements. Positive Feedback Loop: Circular process where one event leads to another, eventually circling back to the original event occurring again; may spiral out of control unless a balancing event occurs.